The National Flood Forum Bulletin for February, sorry it’s a bit late. New OFAS Newsletter just out. As a flood plain city Oxford is very vulnerable: seven main rivers meet at Oxford, with a combined upstream catchment of about 2,500 km2. For over 10 years our Alliance has been talking to, calling on, and working with, the authorities responsible – from the Directors of the Environment Agency to local government and other bodies – to make Oxford better prepared for what climate change will bring. 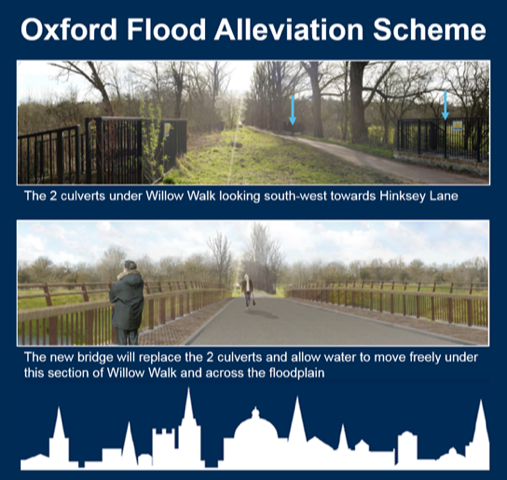 A good deal has already been done but more is needed; the Oxford Flood Alleviation Scheme will enable Oxford to continue to thrive. Without it we may be, almost literally, sunk.